The envelope, please. Yes, the moment has come to reveal the 26 winners and runners-up in our second annual Best of 2018 readers’ choice awards. And, before the get-off-the-stage music plays, we want to thank all our readers for taking the time to vote. In a state that has such abundant excellence across all categories of venues and services, choosing which top the list is no easy task. Voters in this poll are far from the only ones to find the American Riviera beguiling. With its iconic red-tile roofs, 110 miles of coastline, walkable downtown, extraordinary dining and over 200 nearby wineries, demand for lodging in this surfside city exceeded the available rooms. Santa Barbara has responded with new hotels, including the just-opened Hotel Californian and the upcoming Miramar Beach Montecito. There’s also a new museum, MOXI, The Wolf Museum of Exploration + Innovation, with stunning event space aplenty, and, for post-event imbibing, the hip and happening Funk Zone, where you can stroll from one boutique tasting room to another. For the second year in a row, LA Tourism takes the top spot in this category. And, once again, the city shattered tourism records, with 47.3 million visitors injecting an all-timehigh $21.9 billion into the local economy, an increase of 6.3 percent, over 2015’s tally. That upward trend will no doubt continue with the city welcoming two NFL teams, the new George Lucas museum (set to open in 2021) and the 2028 Olympic Games. The newly renovated conference center in one of California’s most scenic cities can host as many as 3,200 participants. As a stand-alone facility it offers 40,000 square feet of flexible meeting and banquet space, including an exhibit hall that’s over 30,000 square feet. The Monterey Conference Connection adds the next-door Monterey Marriott and Portola Hotel & Spa to the mix for a total of 80,000 square feet of flexible meeting space and 720 hotel rooms. In keeping with Monterey’s sustainability commitment, the conference center is on its way to earning LEED Platinum Certification. The $60 million spent on renovating the conference center is apparent in its state-of-the-art technology, flexibility and beauty. 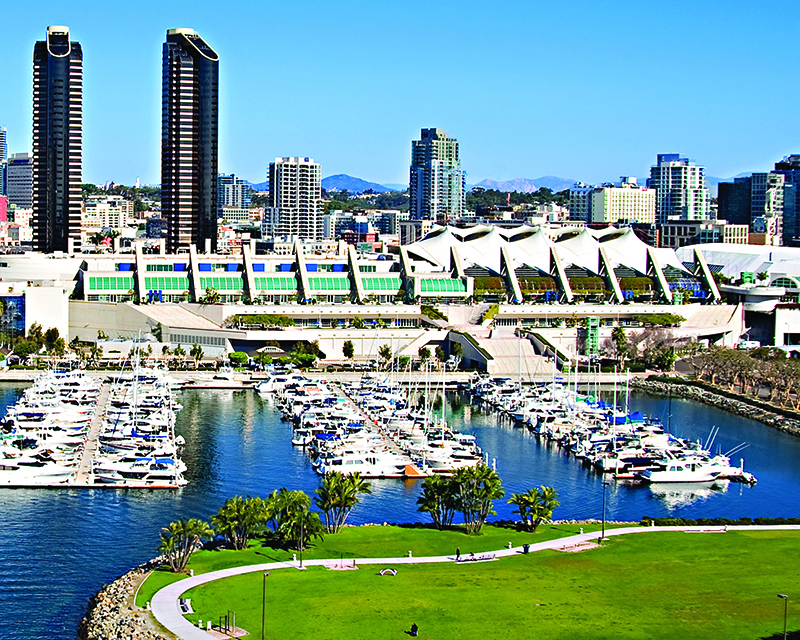 San Diego’s convention center boasts an astonishing 72 meeting rooms, two ballrooms, and over 525,000 square feet of exhibit hall space in the sprawling 2.6 million-squarefoot building. In 2017, the convention center hosted large corporate events with groups including Intel and Best Buy. It also earned an impressive LEED Gold certification and began renovation on the iconic Sails Pavilion, a 90,000-square-foot glass-enclosed, column free space with sweeping views of downtown San Diego and the bay. Located mere steps from San Diego’s breathtaking waterfront and the San Diego Convention Center, this AAA Four Diamond Award-winning hotel boasts 165,000 square feet of flexible meeting and event space. The 34,000-square-foot Sapphire Ballroom is one of the largest pillar-free ballrooms in San Diego; for smaller events, look no further than the Hilton’s chic boardrooms, poolside patio, or one of many outdoor terraces. What could be better than capping off your meeting with a glass of some of California’s finest wine? 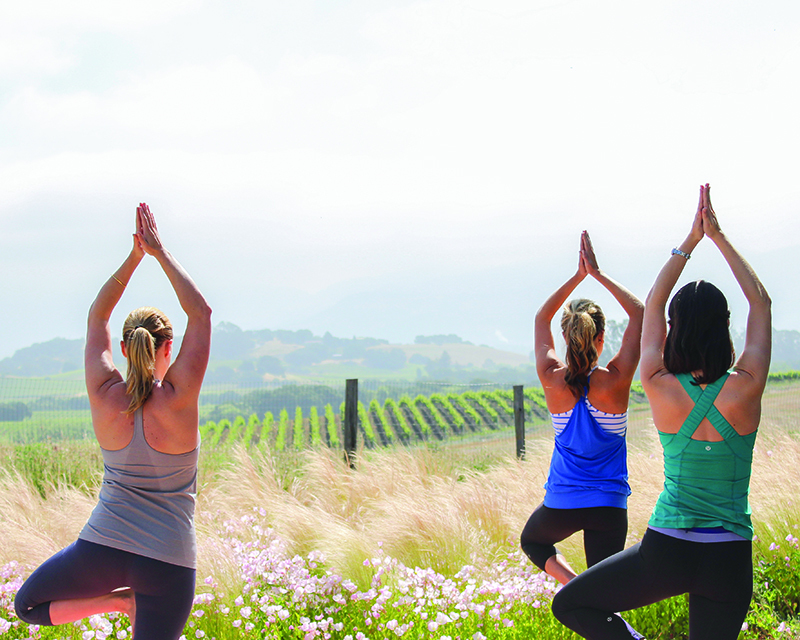 Callaway Vineyard & Winery has six distinct meeting and event spaces that will make the transition from business to pleasure as smooth as a fine Chardonnay. Groups from 20 to 500 can enjoy the winery’s Barrel Room, Reserve Room, Courtyard, Vu Deck, or two lawns offering stunning views of the vineyards and Temecula Valley. San Diego is synonymous with three things: sunshine, beaches and beer. Stone Brewing has been on the forefront of the craft-brewing scene for over 20 years, serving up signature IPAs, pale ales and seasonal releases at their Stone Brewing World Bistro & Gardens locations in San Diego, Escondido, and, as of 2016, Berlin, Germany. Take advantage of Stone Brewing’s spectacular indoor and outdoor spaces, which include private banquet rooms, bocce and movie courtyards and their landscaped gardens, which can accommodate 20-1,300 guests. It’s small but oh-so-exquisite. 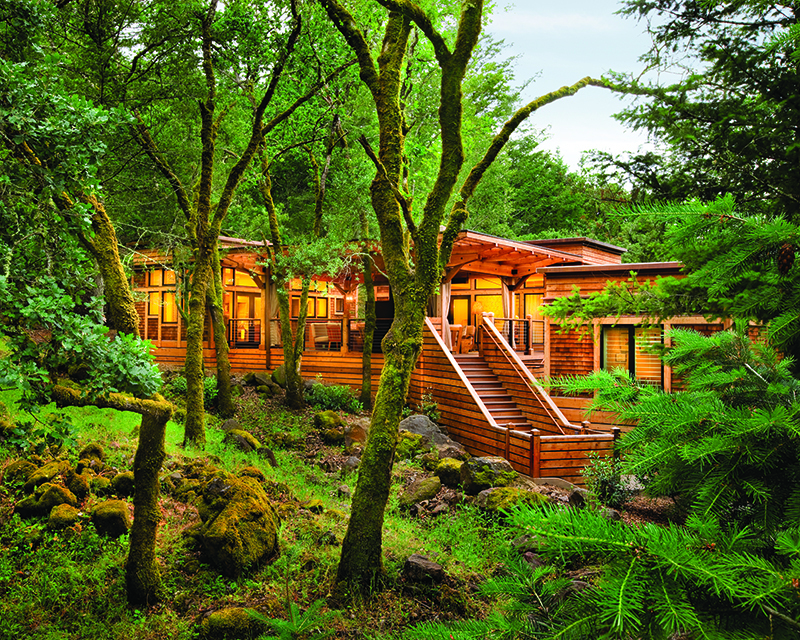 With just 50 free-standing guest lodges surrounded by 157 acres of nature, Calistoga Ranch, part of the Auberge Resorts Collection, is a celebrity and politico hideout that is a fixture on many a “best” list. Pricey and private are the keywords here, with meeting and event venues ranging from a tucked-away, two-room lodge to various lawn, terrace and vineyard settings. The coup de grace: a wine cave hung with chandeliers that can be configured for receptions, dinners and intimate occasions. This repeat winner on the Palos Verdes Peninsula isn’t resting on its laurels, though with its 102 seaside acres, stunning cliffside outdoor event space, extensive conference facilities, eight dining venues, four swimming pools and a 140-foot waterslide, it certainly could. Instead, the AAA Four Diamond property keeps adding new and innovative activities and programs, including farm-and-vine tasting dinners, a frozen treat bar, tastings at the Sea Salt Conservancy (yes, the resort makes it own sea salt), and an expanded beverage program that includes wellness lattes, breakfast cocktails, seasonal mocktails and Bloody Mary and mimosa stations. From boardroom to ballroom, the Ritz Carlton’s 15,000 square feet of flexible indoor and outdoor meeting space can handle it all. The ski-in, ski-out property with direct access to a ski lift is perched like a midmountain castle overlooking the Northstar California ski resort. It pampers like an AAA Five-Diamond resort should, with an expansive spa, a finetuned activity program and flawless guest services. Lake Club, a summer offering that made its debut in 2017, adds indoor and outdoor options plus a beach, a private pier, an activity concessionaire and other amenities on Lake Tahoe’s north shore. With 884 guest rooms and nearly a quartermillion square feet of event space, this AAA Four Diamond property lays claim to being one of the largest resort and convention complexes in the southwestern United States. It is also an oasis of fun, with gondola rides that begin in the lobby and transport guests to several of the property’s six restaurants; a 38,000-square-foot spa; two championship golf courses; 20 tennis courts; basketball courts; lawn croquet; biking; and—Instagram alert!—sightings of the gorgeous collection of exotic birds that call the resort home. This 394-room resort, home to two championship golf courses, hits a hole in one for the second year in a row. Small surprise. It still, after all, is a stunning coastal retreat that overlooks the Pacific Ocean. But for all its away-from-itall serenity, the resort has over 60,000 square feet of indoor/outdoor meeting space, including a 12,000-square-foot pillar-free Grande Ballroom that can host a reception for 1,500. No name in golf carries more cachet than Pebble Beach Golf Links. The fabled course, however, is just one component of Pebble Beach Resorts, a collection of six golf courses and three hotels on the storied Monterey Peninsula. Last summer saw the introduction of Fairway One at The Lodge, which has 30 guest rooms across three two-story buildings and two stand-alone four-bedroom golf cottages. Anchored by a 2,500 square-foot meeting room, it’s part of a flurry of enhancements being completed in preparation for hosting the 2018 U.S. Amateur and 2019 U.S. Open championships as well as the celebration of the resort’s 100th anniversary in 2019. Although it closed briefly in early October as wildfires ravaged parts of Napa and Sonoma counties, this luxury resort in the Carneros wine region survived intact. Meetings and events for up to 175 guests are a big part of the picture here, with venues ranging from a 3,276-square-foot ballroom to intimate private-dining rooms and outdoor spaces with vineyard views. Lodging is in farm-inspired with outdoor showers and, in some, soaking tubs and private patio gardens with fire pits. The award-winning day spa takes it cues from elements of farm and vineyard. Olive and rosemary body scrub, anyone? Nestled in San Diego’s historic Balboa Park, the 11.5-acre Japanese Friendship Garden offers a relaxing escape from city life. The garden’s lush trees, tall bamboo, koi pond, waterfalls, and winding walkways provide an unforgettable backdrop to any celebration. 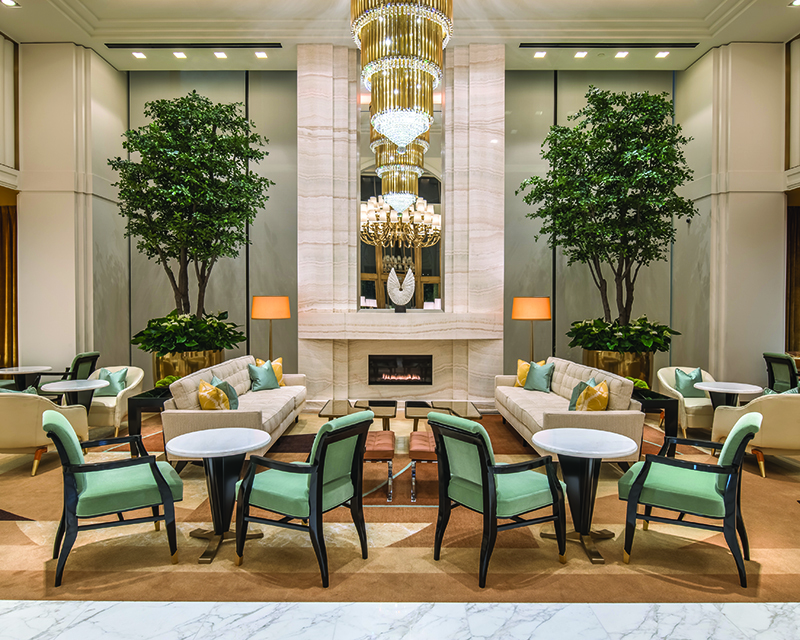 Groups of up to 550 can enjoy the Upper and Lower Gardens, which include event spaces like the new 3,400-squarefoot Inamori Pavilion, courtyard, reception plaza, exhibit hall, and more. San Francisco may offer urban sophistication, but a meeting here doesn’t need to be confined indoors. Golden Gate Park, the city’s 1,017-acre recreational gem, contains many outdoor venues large and small, from the romantic Chinese Pavilion accommodating up to 50 on an island in the middle of scenic Stowe Lake, to the famous Polo Field, capable of hosting concerts for up to 57,000 gyrating rock ‘n’ roll fans. In between are charming sites like the Fuchsia Dell, a tucked-away venue for up to 150 guests outside the Conservatory of Flowers, and the Golden Gate Park Bandshell, seating up to 500 for presentations and events and offering stellar acoustics. Good to know: Nonprofits get a 50 percent break on the regular venue fee. Have a literal field day with your (work) team at Petco Park. Located in the heart of San Diego’s Gaslamp District and across the street from the convention center, Petco Park offers a homerun venue for groups ranging from 20 up to 40,000. The event options are endless: host concerts, festivals, or movie screenings on the ball field; receptions on the rooftop terrace; intimate dinners in the stadium’s many clubhouse and restaurant venues. When this long-awaited 12-story property opened its doors in June 2017, it did not disappoint. Luxury reigns here, from the personal concierge assigned to each guest, to the Rolls Royce house car that’s available for complimentary jaunts into the nearby Golden Triangle. The spa is La Prairie, the restaurants by Jean-Georges Vongerichten. Each of the 170 rooms features floor-to-ceiling windows that open onto spacious private balconies. The best view is from the Rooftop Lounge, which is available for private events. Other meeting space includes the Astor Ballroom (capacity 200), the Waldorf Room (seats 50) and the private dining room and patio at Jean-Georges Beverly Hills, which can accommodate parties of 20 to 200. Guests may well gasp when they enter the lobby of the Portola; the giant living ficus trees that line the atrium are an awe-inspiring sight. Some $6 million was spent on the renovation of the lobby and Jacks Monterey, the new lobby bar and restaurant. The AAA Four Diamond property, which was one of the first in the area to earn LEED certification, is adjacent to the Monterey Conference Center. Its own meeting and event space is expansive, including a ballroom that can accommodate 1,000 guests for a reception. The mouse house continues to entrance parkgoers of all ages. It upped the ante on high-end experiences with the opening of 21 Royal, an exclusive dining experience for up to 12 guests in what Walt had envisioned as a private residence. For large groups, with large budgets, it’s possible to do a complete theme park buyout. And for an unforgettable party favor, consider hiring a Disney sketch artist who can do on-the-spot drawings of your guests’ favorite Disney characters. The Challenge Ropes Course, located on a secluded part of the 10,500-acre property, can be as daunting or as friendly as you’d like. It features low- and high-rope elements that include scaling a climbing wall, jumping (in a safely harness, of course) from a tall pole, crossing a swaying tightrope and enjoying the exhilarating rush of a zip line. Those who prefer to stay firmly planted on the ground can play a role in critical activities like holding ropes or cheering on their colleagues. Though a couple of other rooftop venues have opened in Santa Barbara recently, the Kimpton Canary Hotel remains the only property with a rooftop pool terrace. With a capacity of 180 and unobstructed views of downtown, the Pacific and the Santa Ynez mountains, it’s an idyllic setting for breakfast, lunch, dinner and receptions of every kind. Whether it’s a chandelier-hung tent for celebrity wedding, trendy lounge furniture for a trade show, a family funfest or a stunning vineyard soiree, Classic Party Rentals delivers. It’s one of the state’s largest event-rental companies, boasting a highly trained service team, over half a million square feet of warehouse space and scores of trucks working out of locations in Los Angeles, Santa Ana, San Diego, Palm Springs and Santa Barbara. Clients love the designboard and social-media inspiration that help create and express a concise style or concept. Your group can dine alongside the three-story Kelp Forest, the Marine Mammal Gallery or the doors that open to the Great Tide Pool. Or, they can enjoy a strolling dinner in the Open Sea galleries, stopping at food stations or munching on passed bites as they watch bluefin tunas and leopard sharks speed by, the swirl of schools of sardines, or the leisurely swim of swim turtles. Accommodating groups of up to 2,500, the aquarium can make your gathering even more immersive with enhancements that include a Kelp Forest Dive Show and a Bat Ray Experience. Dinner with dinosaurs. Cocktails in a sculpture garden. Operating flight simulators with co-workers. 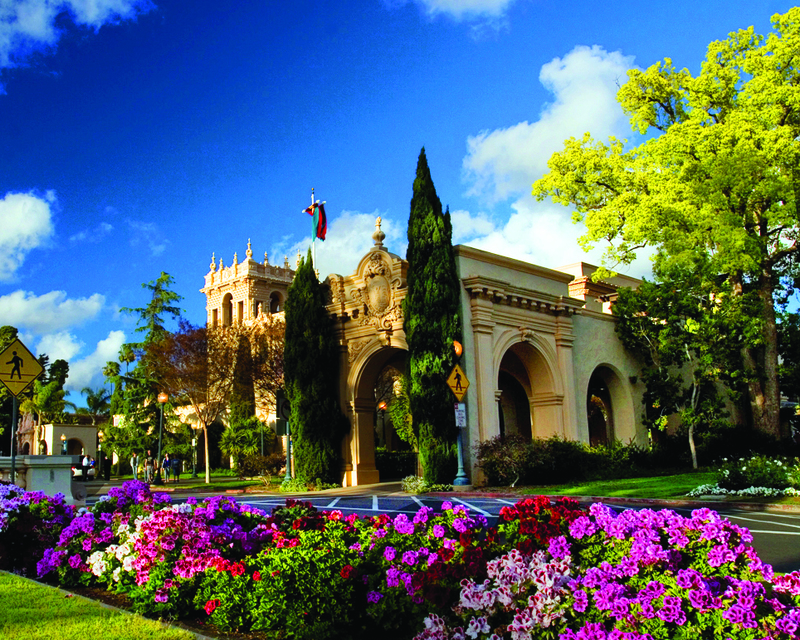 San Diego’s crown jewel Balboa Park is home to 17 museums, nine performing arts venues, 17 gardens, and the world-famous San Diego Zoo. Whether your guests appreciate ancient Egyptian artifacts, botanical gardens, or leisurely hiking along the Park’s 65 miles of trails, Balboa Park leaves a plethora of diverse opportunities at your fingertips.